When most war buffs think about the German bombers of World War II, they remember all the two-engine jobs like the Ju 88 and the Heinkel 111. They can probably also remember the trimotor Ju 52, and perhaps the elegant Focke Wolf 200 four-engine bomber/reconnaissance plane. If they're really good, they know about the massive six-motor Messerschmitt Me 323 Gigant powered glider. This is usually indicated as a Ju-290 being shot down by a B-26 Marauder of the Northwest African Coastal Air Force near the Isle of Bastia, Corsica. 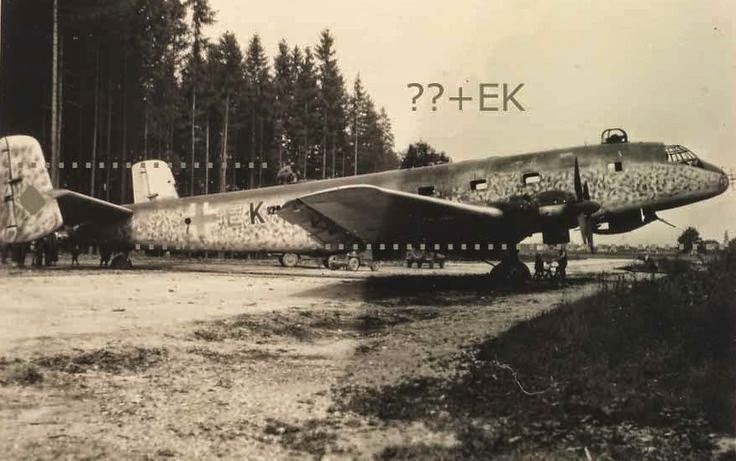 The identity of the plane is disputed, it more likely is a Ju-90. Despite their intense self-protection, some Ju 290s were shot down, including several in one day over the Atlantic in May 1944. Many even recall the failed Heinkel 177, the "flying fireworks" which had the weird (and over-engineered) arrangement of four engines crammed into two nacelles. 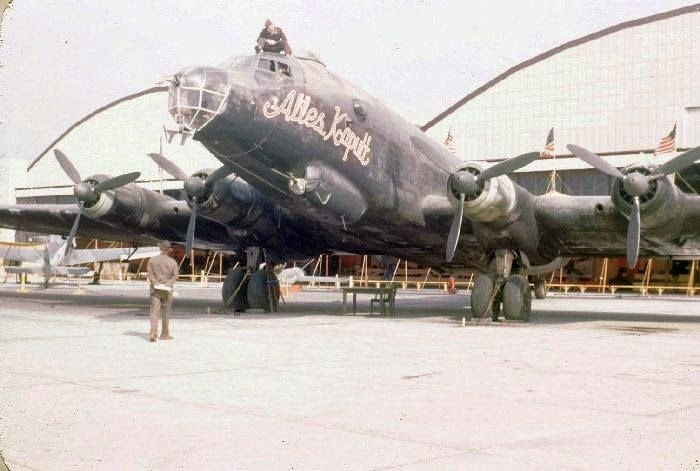 The common thought is that the Luftwaffe had no planes comparable to the heavy bombers of the Allies such as the U.S. Liberator and the British Wellington. This was because the Germans didn't believe in big planes or something along those lines. 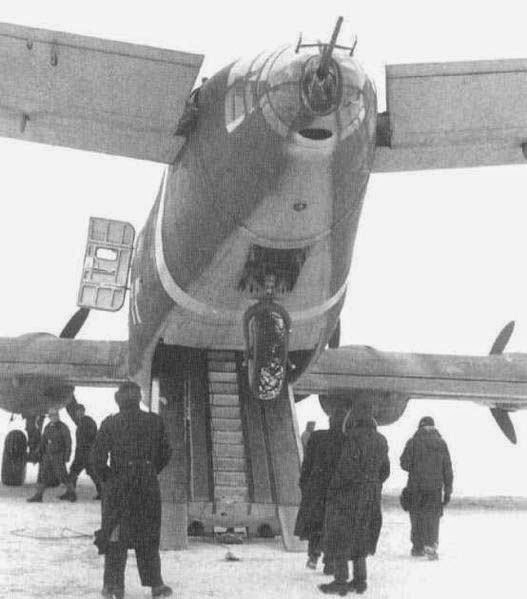 A Ju 290 at Pitomnik, the smaller of the two airfields supplying the beleaguered 6th Army at Stalingrad. That may be a Heinkel 111 to the right. No doubt, this one would have been fully loaded with as many wounded soldiers and couriers and transferring officers and so forth as it could carry on the way back - the pilots often had to stop the planes while attempting to take off and kick some passengers out because the planes were overloaded with absolutely desperate men. However, the Germans would have loved to have had bigger bombers - Luftwaffe Chief Hermann Goering raged about this at times during the war. They spent an awful lot of time studying the American and British designs and working on their own. 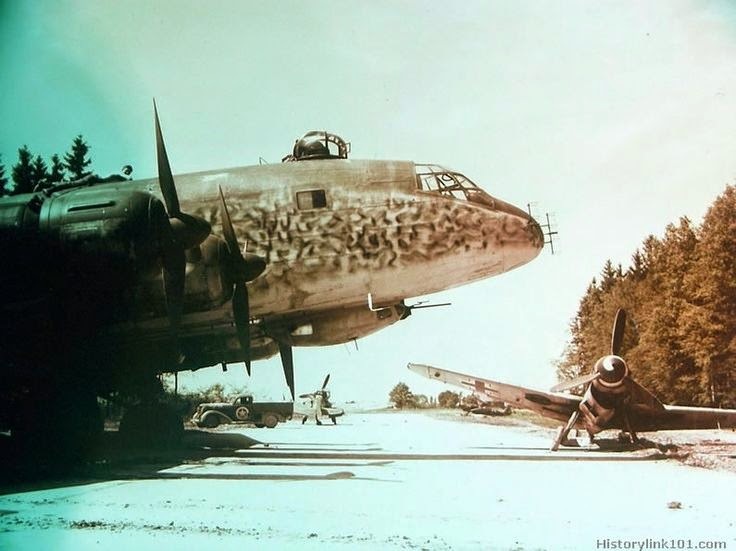 The designers tried to please Goering, but there wasn't enough time and there weren't enough resources to get together a really good heavy bomber fleet for the Luftwaffe. Decisions made before the war took time to reverse, time that Germany did not have. There were, however, a few four-engine German transport planes that showed great promise. 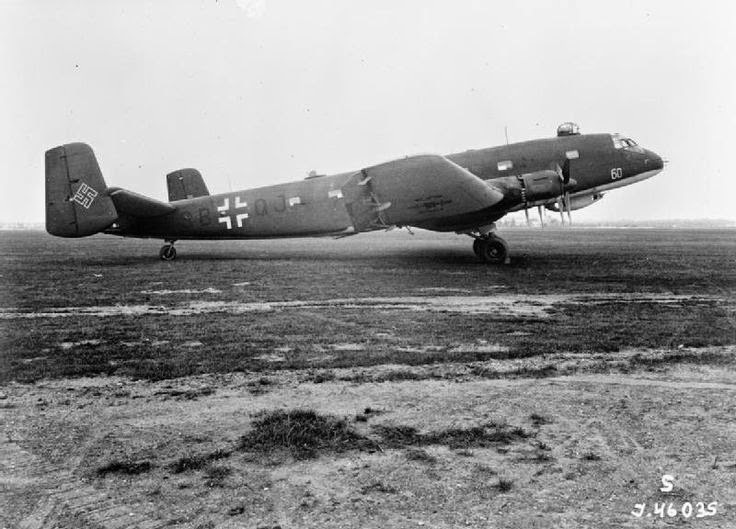 The Junkers Ju 290 was one such plane. 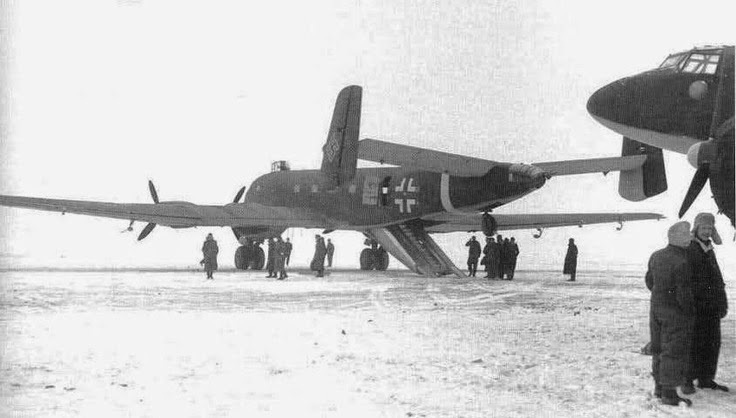 Hitler had a Ju 290 at his personal disposal because his pilot, Hans Bauer, liked the aircraft and felt the Condor was too slow. Apparently, though, Hitler never flew in his - which was not unusual, as Hitler flew only when necessary and had about 50 personal aircraft at his disposal. His personal train, Asia, was usually sufficient for his needs. It is pretty indisputable that the best four-engine plane that the Germans developed in any kind of numbers indeed was the FW 200 Condor. 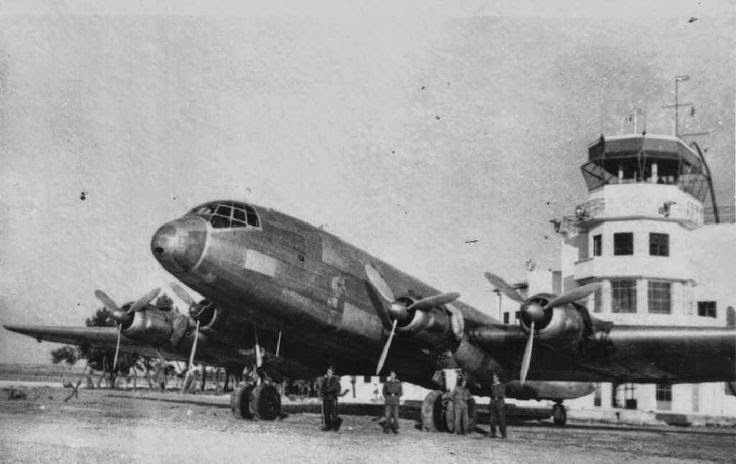 However, as brilliant a design as the FW 200 was, it had some major drawbacks: the bomb load was only a ton, which even some fighter-bombers such as the Focke-Wulf 190 could manage; it was increasingly slower than enemy fighters as time went on, making it too risky to send on attacks; and the landing gear was inherently weak, meaning many crashed upon landing. 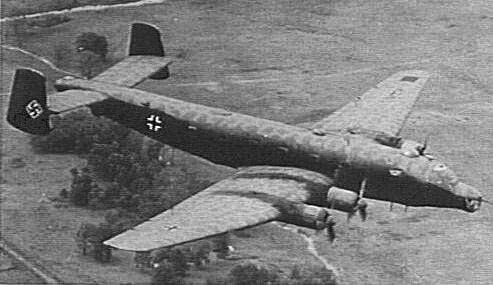 The Junkers Ju 390 was intended to correct those deficiencies of the Condor, and it did so brilliantly. Junkers Ju 290. 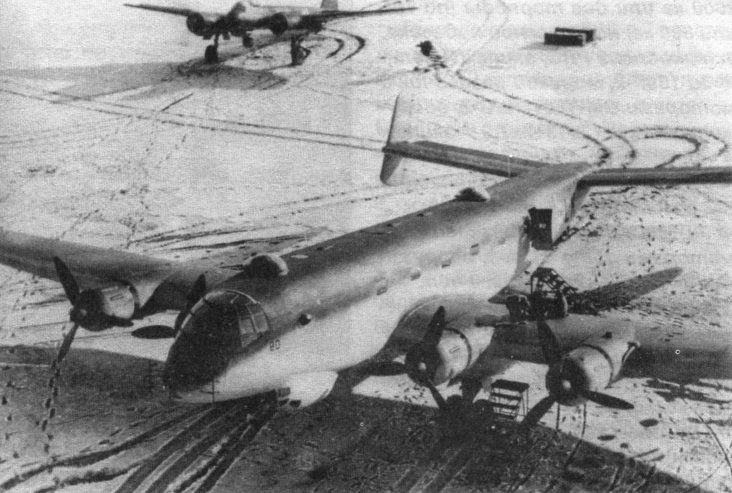 The development program resulted in the Ju 290 V1 prototype (works no. 290000001), which first flew on 16 July 1942. It featured a lengthened fuselage, more powerful engines, and a Trapoklappe hydraulic rear loading ramp. Both the V1 and the first 8 A-1 production aircraft were unarmed transports. The need for heavy transports saw the A-1s pressed into service as soon as they were completed. Several were lost in early 1943, and arming them became a priority. The Junkers Ju 290, as was the custom in German design circles at the time, was adapted from a previous successful aircraft, the Ju 90 airliner. It was designed to be fast and able to carry a good-sized payload, either as a transport or as a (never built) bomber. Junkers Ju 290. A special long-range reconnaissance group, FAGr 5 (Fernaufklärungsgruppe 5), had been formed on 1 July 1943 and during the late summer of 1943 three of the new Ju 290 A-2s were delivered to its 1 Staffel, which became operational at Mont-de-Marsan near Bordeaux on 15 October of that year. They flew their first operational missions in November 1943, shadowing Allied convoys in cooperation with U-boats, and often remaining airborne for up to 18 hours. 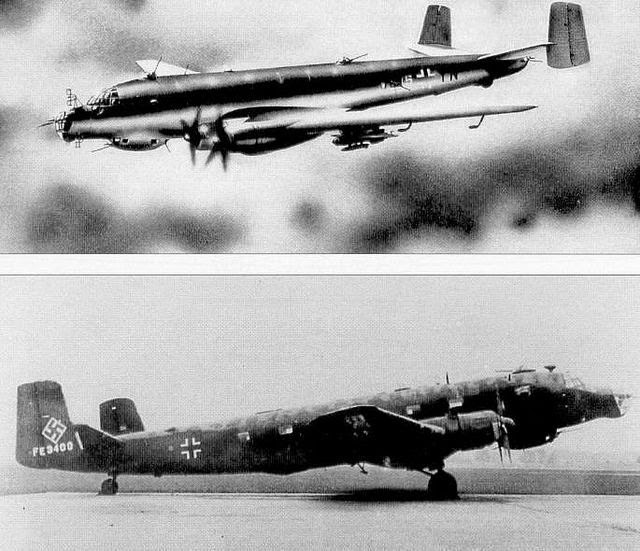 The Ju 290 prototype first flew on 16 July 1942, the time of peak Wehrmacht success. Transports were badly needed in almost every direction, with Rommel in North Africa always short of supplies and the Wehrmacht marching into Stalingrad, supplied by single-track railways. 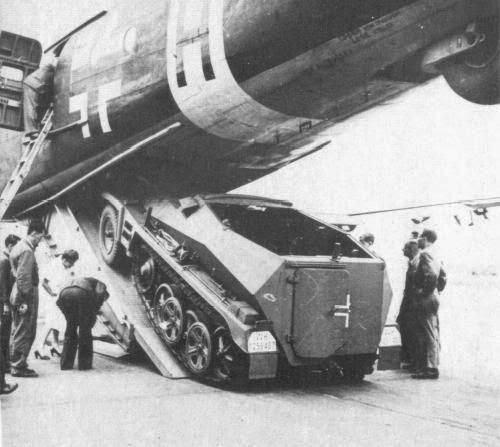 The Ju 290 was pressed into transport service as quickly as they came off the production line. This was the unarmed A-1 production version. This is a captured Ju 290. 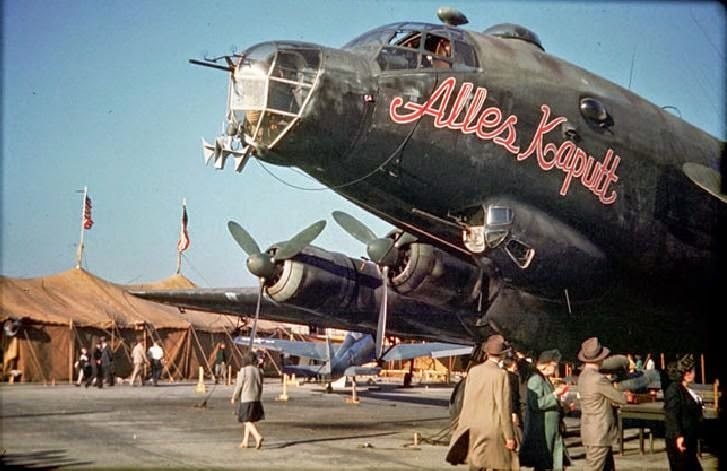 The "Alles Kaputt" was painted by the Allies, that kind of garish nose art would never have been permitted in the Luftwaffe, especially on a prestige aircraft. The Condor, which had given the British fits in 1940-41, was getting shot down in increasing numbers by 1942 in its role of maritime reconnaissance. The Junkers 290 model A-2 filled this role. Three A-1 versions were converted to A-2 models, such was the need. The A-2 had radar and a dorsal turret armed with a 20 mm MG 151 cannon. The radar was used to locate Allied convoys as far away as 50-60 miles. Junkers JU 290, captured in France, 1944. The A-2 was fairly successful in this role, so another version soon came along, the A-3. Aside from navigational equipment, it had cannon tucked all over the place: two dorsal turrets, one in the tail, one beneath the nose, and machine guns in the waist positions and under the nose. It had auxiliary tanks inside and a loading ramp in the rear. Junkers Ju 290 Seeadler. The improved Junkers Ju 290A-7 version appeared in spring 1944; 13 were completed, and 10 served with FAGr 5. Some A-7s and some A-4s were fitted with a detachable nose turret armed with a 20 mm MG 151/20 for added defense against frontal attack. No bombs were carried, as it was intended that the A-5 and A-7 would be used to launch anti-ship missiles. Development continued as the war situation worsened. The A-7 version was introduced in early 1944. This was another anti-shipping version. The A-6 was a 50-passenger transport. All told, 65 Ju 290s of all types were built. The Junkers 290 (Ju290) was developed toward the end of the war; and one of the very first was allocated for Hitler's own use. With a design that was well ahead of its time, the Ju 290 was a four-engine plane capable of transporting 50 passengers. Heavily armed with machine guns and rockets, she was capable of flying nonstop for 4,000 miles, well beyond any other plane of her time. One of the prototypes was captured by the US and she was flown directly from Paris to Ohio with one stop at the Azores. Flying out of Bordeaux, France, the first maritime reconnaissance version flew in November 1943. They could stay aloft for 18 hours and shadow a convoy to direct U-boats into the vicinity. However, despite their utility on missions, the need for transports was too great. For example, one early version was even involved in the Stalingrad airlift. With German fortunes waning, Armaments Minister Albert Speer cancelled the Ju 290 program in the spring of 1944, around the time when all bomber projects were cancelled to the exclusion of fighter production. In reality, the cancellation was due to inter-service rivalries, with Hermann Goering behind the decision because he didn't want aircraft production diverted toward Kriegsmarine needs. The truth was, though, that Admiral Karl Doenitz in charge of the Kriegsmarine didn't really need the Ju 290 any more anyway despite his insistence to the contrary - the Battle of the Atlantic had long since been lost by the time of the Ju 290's cancellation. The aircraft had simply become a way of the top dogs asserting their egos, with actual military need only a secondary consideration. Goering may have been gradually losing influence with Hitler, but he still had a tight grip on aircraft production, so his decision was final. Junkers, Ju.290. On 26 November 1943, Ju 290 A-5, no. 0170, along with many other new aircraft and prototypes, was shown to Adolf Hitler at Insterburg, East Prussia. Hitler was impressed by its potential and told Goering that he wanted a Ju 290 for his personal use. A Ju 290 was not however assigned to the Fliegerstaffel des Fuehrers (FdF) until late 1944, when an A-7, works number 0192, was supplied, which had been formerly assigned to the maritime reconnaissance unit FAGr 5. The remaining Ju 290s continued flying, but the French bases were lost by August 1944. Some flights were planned to Manchuria for various minor purposes, but it is not known if any actually were carried out. The initial plan was to fly a northern route across the Arctic and then down to Manchuria, and there were also rumors of later flight from Odessa or thereabouts to Manchuria. If any such flights were made, all records of them have been lost. 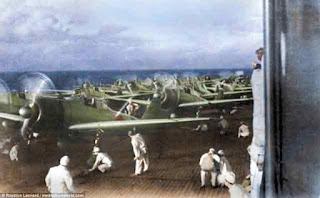 The Japanese, hard-pressed by the Americans, did not want to antagonize the Soviets with overflights of Soviet territory, so it is unlikely any such flights were made. Incredibly, the Junkers Ju 290 were still flying regular routes into April 1945, with one landing that month in Barcelona on a routine airline passenger flight. Spain suspended such flights on 21 April 1945 due to the worsening war situation and impounded all Luft Hansa aircraft on its soil, keeping them for post-war use of its own. Hitler's personal Ju 290 was destroyed in a bombing raid in March 1945. There are no known surviving examples of the Junkers Ju 290, the last one apparently having been scrapped by the Spanish in 1957 - though there may be salvageable (with intense difficulty) fairly intact wrecks at sea. A Ju-290 (see comments below) found by the Americans at Salzburg, Austria. This appears to be the same plane as in a previous picture above from a different angle. The aircraft being shot at by a B-26 Marauder near Corsica was a Ju-90 of the Baden Courier flight and none of these Ju-90 were ever shot down. Thanks for the IDs, Rainbow-Samurai, appreciate your sharing your knowledge.